*Timings are approximate, and subject to change. Please use these as a guide only. This is a Free Flow event which means that you can choose to sit or stand to watch the show. Entry for everyone will be via Entry D and Entry E, and you will find bars, merchandise, and entry to the concert all on the ground floor (food can be found upstairs). 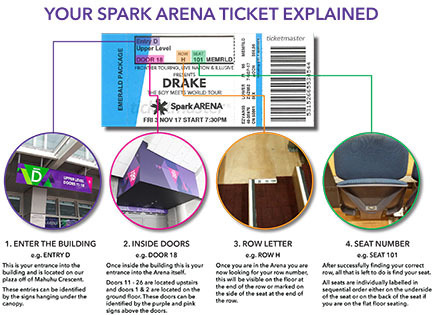 The seats can be accessed via stairs from the standing floor area. Please feel free to move between seats and the standing floor during the night! Entry B which is our mobility access entrance that you are welcome to use if needed. There will be pat downs, security wanding, and a full bag search on entry, so to help keep it simple check out our conditions of entry. If you bring a bag larger than 30cm x 30cm you will need to leave it at our external bag check area for the duration of the concert. Bottles of any kind are not allowed into the venue for this show - we have a range of drinks for sale and free water stations available on both levels of the arena to keep you hydrated. The merchandise caravan will be open from approximately 5pm. The caravan is located outside the arena on the main plaza. Our pre-show diner The Tuning Fork will be open from 5pm, serving a selection of freshly-prepared meals, supported by full bar service. The Tuning Fork is on the right hand side of our main plaza, all welcome.